Do you want to use a nice sharpener for your kitchen? If your answer is yes, then you will have to get Chef’s Choice 1520 Angle Select Sharpener which has the ability to create a new sharp edge. This multi-stage knife sharpener is easily fit in your kitchen that is ideal for you old knives. It is true that most of the knife sharpeners have lack of ability to restore more than 15-degree edge, but this sharpener can easily create 15-degree edge for Asian knives and 20 degree for American and European style knives. This 1520 Angle Select Diamond Hone Sharpener is very efficient for sports knives, pocket knives and double level blades. We can purchase this sharpener without any hesitation. The dimension of this sharpener is (6.25 x 3.37 x 12.0) inches. Total weight of this is 4.60 pounds. This sharpener is made by the instructions of North American Electrical standards which is suitable for the customers of USA and Canada. This nice sharpener is very efficient for household use, that’s why we can use it for our kitchen. This sharpener is known as multi-stage electric knife sharpener. 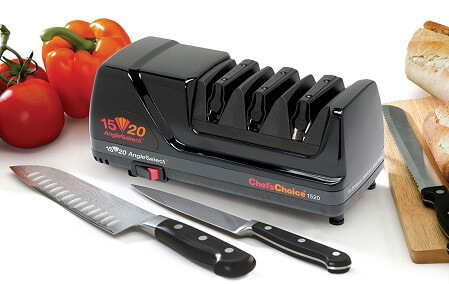 This chef’s choice sharpener can sharpen Asian-style, American style and European style knives. It is also efficient for sports knives, pocket knives, traditional Japanese knives and Santuko knives. The performance is this sharpener is amazing which operates on three stage sharpening methods to sharpen all types of kitchen knives. Three stage sharpening methods can easily match your all needs. Stage 1 and 2 are designed to sharpen dull knives. On the other hand, Stage 3 polishes the sharpen knives. This knife sharpener is recommended by many expert chefs that is treated as the high tech precision sharpener. It is made for butchers, chefs and housewives. The shape of this sharpener is unique and extraordinary and the design of this sharpener is different than others in the market. This knife sharpener has two different angle settings. It is designed to match the blade of the knives. One option is for 15 degree and another option is used for 20 degree. 15 degree angle setting is used for sharpening blades and 20-degree angle setting is used for sharpness and strength of the kitchen knives. A non-slip rubber base is attached with this knife sharpener. It is very helpful to control the sharpener. It provides a stability during the period of operation. This feature ensures safety. We can setup sharpening angles according to our requirements. This sharpener is compatible with all types of kitchen knives. It is very precise for our kitchen. This item takes less space in our kitchen. The price of this sharpener is little bit high. Too much sharpening can damage your sharpness. This Chef’s Choice 1520 Angle Select Diamond Hone Sharpener is an ideal choice by many professional chefs and butchers. It has the ability to keep your knives sharp forever. It provides an optimum performance during the period of service.If we use this sharpener on regularly, we will be able to get an impressive edge and extension of the blades life up to some certain years. The activities of this knife sharpener gives them an ultimate pleasure. Although the price of this sharpener is high, but it provides you a safety.The manufacturing company of this is promised to deliver you a good machine which can fulfill your kitchen requirements.